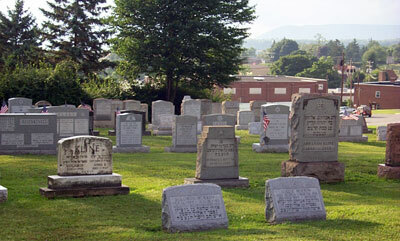 Ahavath Achim Cemetery was begun with land donated by David & Bessie Kline on Nov. 1, 1922. It is a Jewish burial ground. The property-encircled, Ahavath Achim Cemetery, a Jewish cemetery, is situated along side the flat section of St. Joseph Cemetery which is behind 132 Belmont Street (Now Cernic's (a motorcycle dealership); formerly, Saylor Bros. Hardware Supply Center building, which, in 2010, was empty, Busy Beaver Lumberyard, and initially the Wise Bros. who ran Busy Beaver. It is also behind Stem's gas station/convenience store). It has its entrance road between 132 and 134 Belmont Street, Geistown Borough, PA 15904, Johnstown address since Geistown is a suburb.